some girls go for gadgets | What Will We Use? Yesterday when I got home from the office supply store, my husband asked, “Do you want to go to the mall?” This time we went to South Hills Village Mall which is not the same mall where I picked up my Droid. Just three weeks ago, my Droid was purchased one day after its release. My husband lovingly realizes that I am thrilled by gadgets as some girls would be thrilled by jewellery and agreed to make it my birthday present. I am still wowed by the Droid. My husband suggested that we go to the Verizon store to see if there were any Droid accessories available. They were sold out. 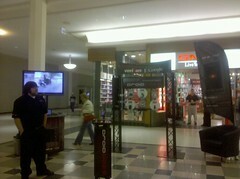 Within line of site to the Verizon store there is a Droid display which will be staffed every holiday weekend. Yes. A whole display just for one telephone product. There were many people who stopped by to play with the many Droids on display but all but one booth employee were too shy to pose as I excitedly took a photo with my Droid. The picture you see in this post was immediately uploaded to facebook and flickr.com. No need to sync the phone with my desktop at home. This is when I realized that I was already living in the cloud. Cloud computing that is. Google stores my calendar and contacts so I do not need to worry about backing that up to my PC. Flickr.com, a Yahoo! site, stores my photos. Facebook makes it crazy easy to share my picture that I just took on my phone with all my friends… all of this without leaving the mall. The Droid is not exactly forthcoming about being a product built on Linux and to some, this is a good idea. Still, if they would mention Linux in even a quarter of their advertising and posters, they would be by far the single marketing campaign of Linux product: far beyond the tux500. Google, Motorola, and Verizon have marketed the Droid phone as the anti-iPhone. In one TV commercial they pointed out that Google encourages open development for its “market” of apps. This is important because it allows and even encourages individuals and even competitors like Yahoo! to make applications for the Android platform. Why not go on to boast that they are built on the stability of an 18-year old operating system called Linux? The power of the Android Linux open platform is the whole power behind DroidDoes. Think that this open source mobo-jumbo can not effect the consumer, why in the world won’t Apple let Google implement voice search? Anyhow, Android Linux phones will be holiday gift giving favourite. Want your own Droid? Get it dropped straight to your back yard. My mother has already bought a phone, the Android-based Moment because she is a loyal Sprint customer. I played with it for 5 minutes and it had many of the Droid features but it was slow in comparison. Mom still intends on buying two more Moments for her sister and her brother-in-law. At least in one corner of the South Hills Village Mall, Microsoft lacks majority market share on November 28, 2009. This entry was posted in Apple, Google, Linux, Marketing, Software as a Service, Uncategorized, Yahoo!. Bookmark the permalink.